The neighborhood of Warrior’s Mark rests in the crook of a long arm extending down from Peak 10. It’s south of the ski runs at the base of Peak 9 and west of Highway 9. 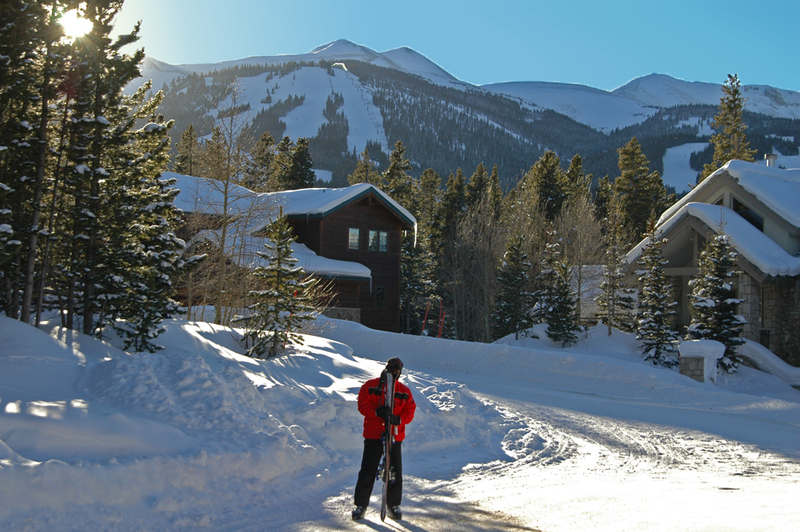 Annexed into the town of Breckenridge in 2002, the neighborhood is a diverse mix of single-family homes, duplexes, townhomes and condos arranged around or near the main road called Broken Lance. This thoroughfare runs past the Blue River, and the community greenbelt. Be sure to register with Breckenridge Associates to take advantage of our free webtools, perfect for customizing your Warrior's Mark homes search. Register online now. The neighborhood and subdivison is derived from the Warriors Mark mine, which was one of the greatest producing gold mines of the Breckenridge Historic Mining District located high up Indiana Creek on the east side of the Blue River valley, near the abandoned town of Dyersviille. As it remains, today, it’s an example of the technology used to recover gold. The first of the Warrior’s Mark homes were built in 1968, and were outside the boundaries of the town of Breckenridge. Peak 9 had yet to be built, and this neighborhood looked almost suburban. Gradually, condos and small multi-family units filled in the vacant land between downtown and Warriors Mark, but walking paths and good roads make this area a very convenient neighborhood. Town utilities like water and sewer have always been available in this neighborhood, and now the free bus service is also provided to most of Warrior’s Mark. In addition to the free public transportation to the base areas of the ski resort, Warrior’s Mark residents have made convenient trails along the river to the Quicksilver Lift, and also packed trails over the west side of the ridge to the Lehman trail to ski directly onto the lifts. In the summer, sidewalks and trails make it easy to get to events in town, and links to the Burro trail make it possible to access national forest. The Illinois Creek Trail crosses Highway 9 at the northeast end of Warriors Mark. This trail passes, through town open space, behind the Breckenridge Ice Rink, around Little Mountain and into Wakefield. Number of Units: 993 in the neighborhood: 149 single-family homes, 105 townhomes, 78 duplex/triplex units, 661 condos. Size: 645 sq. ft to 8986 sq. ft. Amenities: family friendly, on bus route, in town, walk to slopes, trails nearby, community open space, fishing on the Blue. Warrior’s Mark is located southwest of the intersection of Boreas Pass Road and Highway 9, in the southern corner of the town of Breckenridge. Driving south on Main Street through Breckenridge turn west (right) on Broken Lance Drive. If you would like more information on Warrior's Mark real estate, or any other Breckenridge neighborhood, please contact us online.